A stunning 1930's Style Beauford Tourer, a real head turner, great for any special occasion. 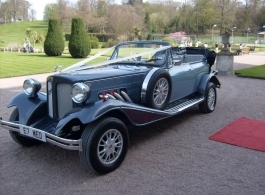 This vintage style wedding car is fully convertible and comes in a two tone blue and gun metal grey. Please note that the frontpassenger seat has been removed to allow for ease of access to the back seats. This Beauford is comfortable for two rear passengers although 3 can fit in subject top height and size.